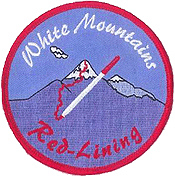 “Redlining” in this context means to hike all of the trails described in the AMC’s White Mountain Guidebook. 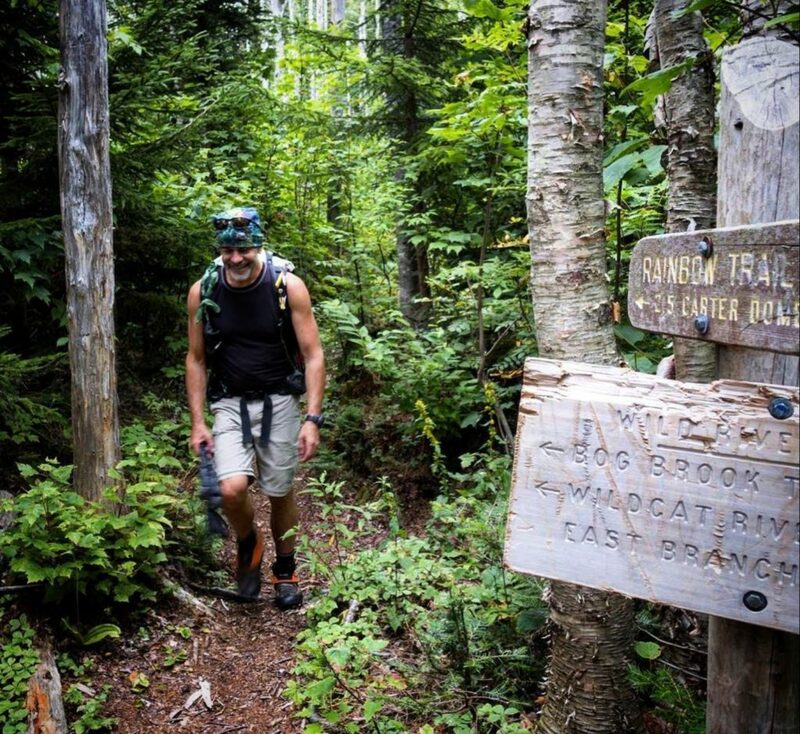 That’s 1440.4 miles based on the book’s 29th Edition, but since the most basic out-and-back trail requires two trips — out and back — it adds up to a whole lot of hiking and exploring when it’s all said and done. Redlining is a novel, rewarding pursuit that takes its participants all over the region’s White Mountain National Forest and more, and exposes them to some real hidden gems. Two guides here have accomplished this feat. First, Bill Robichaud was the 29th person to do this, now Redline Guiding owner Mike Cherim has become the 37th person to reach this goal. What follows is an essay about this experience. I wonder where that goes? I had been accompanying my good friend Bill Robichaud a.k.a. 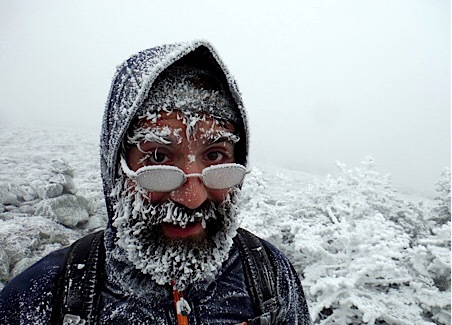 The One Who Got Me Started (see photo of frosty-faced hiker, inset) on several hikes to far flung locations, some not even found on the area’s hiking maps. They were described in the White Mountain Guidebook, and because of this, Bill was hiking them. All of them. Bill was “redlining.” I thought he was silly. But we’re friends. We hiked most of the winter 48 together. I didn’t judge. Well, I did judge, but that’s what friends do. Being that I wasn’t working on a list at the time, that there was nothing driving me, I tagged along on a lot of Bill’s oddball hikes. Some were fun trails, while others were pretty boring. Especially when you start comparing some of these lesser trails to some of the area’s greats. And we did oddball things, unnecessary detours and repeats, all in the name of redlining. It’s a sickness, I tell you. I was glad I didn’t have it! Based on the most common White Mountains hiking maps, and as silly as this sounds, if one’s not really paying attention, one could assume Glencliff, NH, is right next to the Vermont border. It’s not. There’s a good chunk of New Hampshire that lives between the two. The Appalachian Trail runs through it connecting those points. There are also a couple 52 With-A-View peaks out that way (Smarts and Cube Mountains). Based on the maps and the narrower focus of, say, a person working on their 48, it’s really easy to be ignorant about this and assume the world we care about begins at Moosilauke. Redlining western part of the state, we follow the Appalachian Trail (AT) through Hanover, NH. My first real introduction to this area, aside from my isolated forays to the two aforementioned 52 WAV peaks, was when Bill asked if I wanted to join him on a redlining backpack from Hanover to Glencliff. I love backpacking and to me it sounded like a grand adventure. Five days, four nights. At that time it was my longest backpack (I have since gone 21 days on the Long Trail… also with Bill). The stoke was high. Shelter living is a luxury. Our weather cooperated, reasonsably enough — meaning it rained a little but we managed to stay dry — and the experience was quite enjoyable. I also really enjoyed the exploration of the “uncharted” area. (Note: The Nat Geo AT map for this section can fill in the gap.) We hiked over the bridge from Vermont and hiked through Hanvover, NH. We shared coffee and ice cream with the late Bill Ackerly, a perpetual live-by-the-trail trail angel in Lyme, NH. In other words, nice memories were formed. At the end of the last day I decided to download the spreadsheet and start keeping track. Bill Robichaud meets trail angel extraordinaire, Bill Ackerley. After consulting the online guide, talking to Bill at length, examining my records of doing the 48 a few times along with other things, I found myself between 42 and 43% complete. I was ready for more. Please bear in mind, however, I wasn’t a redliner. I was just keeping track. 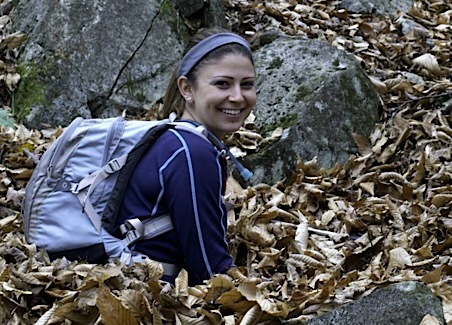 Hiking to the Bonds is a rite of passage for many working on the 48 4000-footers in New Hampshire. A redliner would make that really long hike for the sole purpose of nabbing the Guyot Shelter Spur. Yes, I know someone who did that. I found myself making all sorts of crazy out-and-back hikes on connector trails while making doable shapes with the rest. And then there were those times when I missed stuff. Cruised by Imp Shelter Spur pre-redlining, hiked Cabot three times looking for that damn spring, or that like that time I realized the Alpine Garden Trail went all the way to the Auto Road. Who knew? The process of organizing, planning, and keeping track takes many forms. This book and this map a big part. 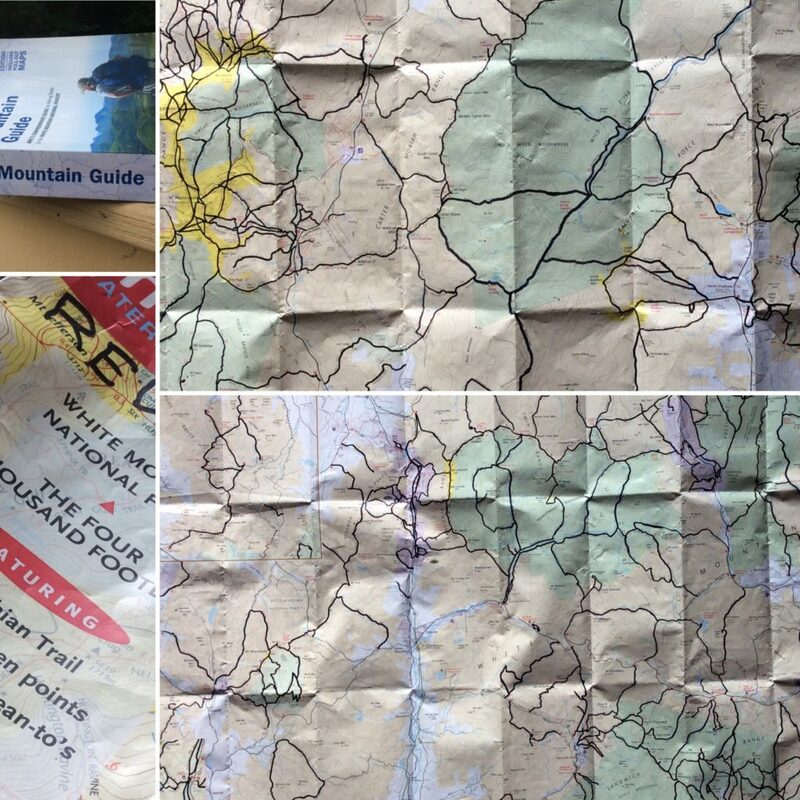 Like many redliners I bought one of those inexpensive waterproof White Mountains maps by Map Adventures. It’s a steal for only $9.95 at Mountain Wanderer. Having this map I could blackout the lines as I hiked them which helped me visualize what I needed to do and how I wanted to go about attacking the rest of the trails. The logistics of redlining is not easy. If you really want to get picky, too, route directions and other considerations come into play so as to save mileage and gain. At some point, though, most give up getting too picky. We just want to hike. I hiked. And hiked. Exploring the region’s secrets. At some point I became a redliner. First up was Howard Aronson. He and I have been good friends for four years or so and we enjoyed hiking together a lot. Howard is a hard-charging man. Not quiet, or timid, Howard at times is larger than life itself. But I appreciate him for who he is. That energy carried me through at times. He carries and sometimes struggles with the baggage of his past, but sometimes I was able to lend him a hand, too, albeit in a different way. Howard is also a guide here at Redline Guiding and if our guests are lucky enough to be assigned to him, they will likely relish his stories of hikes past and his unique charm and passion for hiking. Howard wasn’t redlining, but was interested enough to join me on my quest much the way I was there for Bill. Like drug dealers we might have been contributing to our friends’ addictions. Howard has recently downloaded the spreadsheet for himself and is currently in need of a new hiker to take under his wing. He’s just over 50% complete. Everyone knows someone who is a bit obsessive. Then there are those who think OCD should be CDO. My friend Jim StCyr might possibly fall into that latter category. 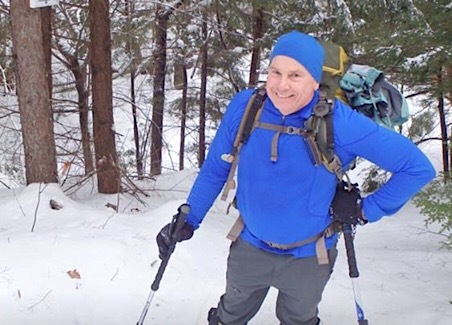 Jim and I found ourselves teaming up for many redline hikes — but only if they benefited both of us. We would struggle over this at times being sure that our time was spent as effectively as possible. It was great for me because Jim is a planner. 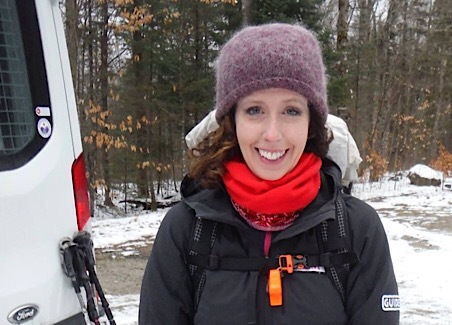 A hike together brought about the exchange of maps, printouts, and elevation profiles. Jim was very complete and thanks to him, I could just sit back a lot and enjoy the hike. Jim, whom I affectionaly call “Gizmo,” introduced me to a lot of technology. He taught me to download a trail and plug it into my GPS so I could see that redline superimposed on a map. Cool. It saved Bill and I on one hike (Three Ponds Trail). At the time the trail was really hard to see but that GPS showed us where to look. We would have likely had to head back if not for him. Jim is nearly complete with redlining himself at the time of this writing. Then there was Ashley Amber. She is a friend of Bill’s and started accompanying us on several hikes and backpacks. She was also redlining, yet somehow didn’t fit into the stereotype formed in my mind’s eye. Too cute, perhaps. I knew Ashley was a cool redlining partner when I needed Hutman and Hall’s Ledge Trails and she stepped up to help with the car spot and to hike them with me. You may wonder why this is significant. Well, Ashley had both of these trails already… and they’re sort of one-and-done trails. Difficult to follow in places and not super exciting. This was very kind and unselfish of her. When Bill mentioned she might show up at my redline finish I was stoked and honored. Absolutely, I said. And in what I’m learning is typical Ashley fashion, she needed no trails in the area. This means her only reason to be there was to be part of the celebration and to high-five me at the appropriate time. I hope I can be part of her finish which, like Jim, isn’t far that away. Last but certainly not least, there is my wife, Barb Cherim. She is not redlining, but was there for me while I was. The silly out-and-backs, the repeats, the miles, the gain, the bugs, the sweat, and the demands that come with the redlining territory. She complained about none of it. Well, maybe a little… but very little. We backpacked, we got rained on, worried about storms together, rationed food because of the possibly of a forced stay (due to high water), we sweated, we froze, we endured. She endured me, and that alone may be patch-worthy. I did all this because I was driven to finish what I started. To explore. To hike them all. To earn a silly patch. Barb… well, Barb was there for me! Plain and simple. Sure, not every hike was about Mike and his silly redlining — we worked on and finished Barb’s 48 as well as other stuff like starting the Belknaps — but I alone hoarded most of the agenda. Now, it’s about hiking for the sake of hiking, and Barb’s lists now rule if she wants. Thank you for your help! The laughs, your companionship, a car spot or a ride, your patience… you know your part. I completed redlining the 29th Edition on August 25th of this year. I should have finished a whole year earlier. Based on my killing off a solid 40-plus percent in 2015, bringing then my total up to 85% for the the start of the 2016 season, it’s a reasonable expectation. That said, it takes people years to do this, generally. Unless you’re Matthew Hickey, redline finisher #22, who went fulll tilt during a period of unemployment getting the whole thing done in a mere 193 days. Taking years is normal. I do… hey, how do you feel about a redlining honeymoon? Or not. We went on a cruise to Bermuda. Freaking feet! They’re not perfect, but they’re all I have. That said, my main hiking partner, my wife Barb, has her own foot issues so we still backpack some things that could be long day hikes. It’s okay, though, because redlining isn’t a race. It never was. As I said about the western part of New Hampshire in the bit about Vermont to Glencliff, above, the Great Northern Woods is likewise not on our regular hiking maps. I mean, Canada may as well begin immediately north of the Kilkenny Ridge as far as most 4000-footer loyalists are concerned. 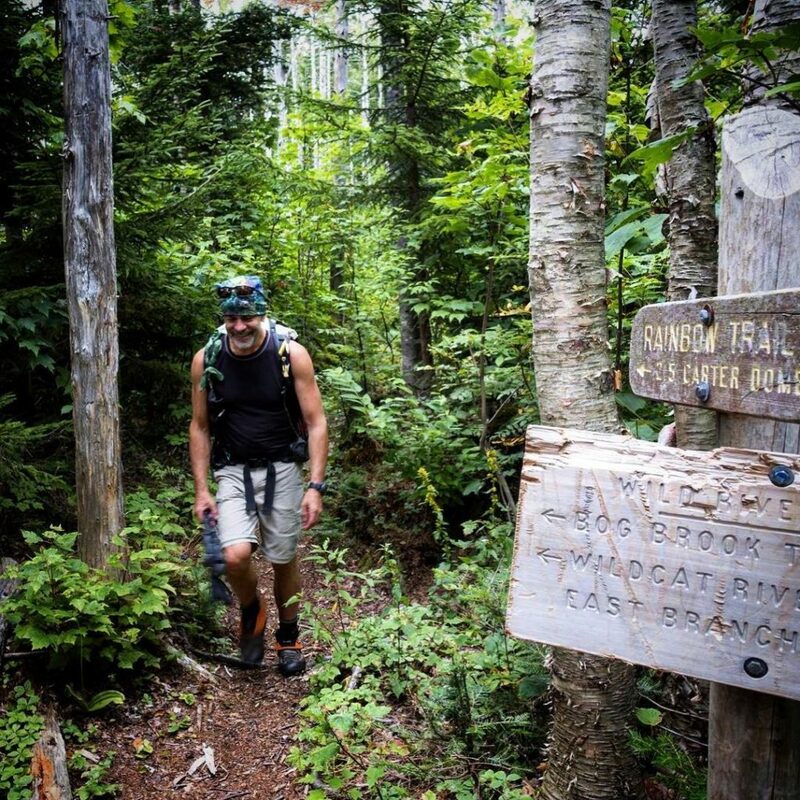 There’s a lot up there, though: Magalloway Mountain, Umbagog, the Percy Peaks and trails in the Nash Stream Forest, Dixsville Notch and its Table Rock, even the Fourth Connecticut Lake Trail that actually runs along the clearcut swath between the United States and Canada. It’s probably the only trail where the first tenth of a mile or so is under the watchful eye of Big Brother. How exciting is that? This is all cool and mysterious stuff. It’s all up there. Waiting. Big Brother is watching you… redliner. I’m pointing out this spreadsheet tab because I think it represents one of the amazing aspects of redlining: discovery. The sense of mystery is incredible, especially when you’re reading about places but you cannot even see their innocence on a map. It’s like Maine, for goodness sake. The whole western part of Maine may as well be on the dark side of the moon. I’ve been there, hiked my New England 67, so I know people live there and there are roads… but still. It’s like the Wild West until you’ve been. It’s like driving by those trail signs wondering where that goes, but on a much larger scale. As I mentioned, the great part about redlining is the freedom of choice and the ability to get away. In the beginning the world is your oyster. So much to see, so much to do… but you’re young. Near the end, though, if it will ever seem like a chore it will do so then. Gone are the grand choices. In the end you start working toward the act of completion. Logistics drive you, old-timer. Incredible view of Rainbow Ridge, Carter Dome, and Mt Height from No Ketchum Pond in Perkin’s Notch. 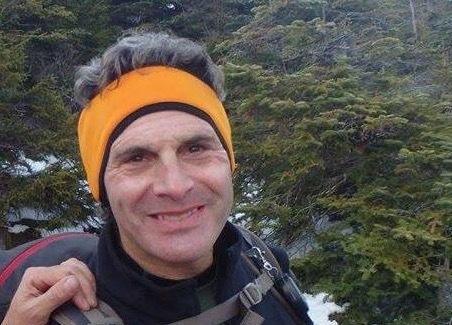 According to the “Robichaud Edict,” a term coined by Jim StCyr (above), a redliner shall not finish redlining on the same trail or trail section as a prior finisher. So far this has been upheld, albeit accidentally in all likelihood. Eventually someone ignorant to the edict will break the chain… or we will run out of trails and trail sections. To those of us in the know and on board with Bill’s edict, it adds to the pressure. To have it all swirl down to a specific trail. I finished on Rainbow Trail, one touted by many as the “prettiest in the Whites” (it was amazing). At the beginning of my last trip out I hiked into the area with Barb via the East Branch Trail. I hadn’t hiked it yet. It’s swampy in places, but quite nice as it tours the East Branch of the Saco River. I then hiked on the Wild River Trail to No Ketchum Pond, the source of the Wild River, and Perkin’s Notch Tentsite. Barb and I established camp there. Afterward we hiked to the foot of the Rainbow Trail to complete that bit. There I drew a line in the dirt. The line I’d cross at the end of the following day’s effort. We went back to camp, a site we had to ourselves for the night, and went to bed before the sun went down. We did this because we planned to be up early. The next day would send us on a 13-plus mile loop with thousands of feet of elevation gain. Barb crosses blowdowns during our alpine start. We got up early on our own and managed to get on trail with headlamps at 4:30 am. We were to meet Bill on the summit of Carter Dome at 2:00 pm and we didn’t want to be late. He was going to join us for the final trail. We made good time, even though that upper part of the Wild River Trail is wet and brushed in and less than simple by headlamp. By the time we hit the first large tributary, Red Brook, we had our lights off and were cruising. Before long the Wild River Trail was done, not long after grabbing the Spruce Brook Tentsite Spur, of course. By 7:30 am we encountered the first person of the entire hike just as we were starting on Black Angel Trail. We also saw two others on that trail. To redliners, that’s a crowd. We loved that trail and saw it, too, completed. By 12:30 pm we were on the summit of Carter Dome. We ate, rested, admired the twinkle of the broken glass up there and tried not be be trampled by the herd. We couldn’t wait. We started down Rainbow Trail. There is a beautiful area, the Carter Dome south summit, that has great views. We figured we’d just meet Bill there as he was heading up from Perkin’s Notch. Celebratory shenanigans on Carter Dome’s magnificent south summit. We found him (or he found us) about one tenth of a mile from where we had hoped we would find him and after a lengthy break on a mountain we had to ourselves, we slowly made our way to the end of the Rainbow Trail. 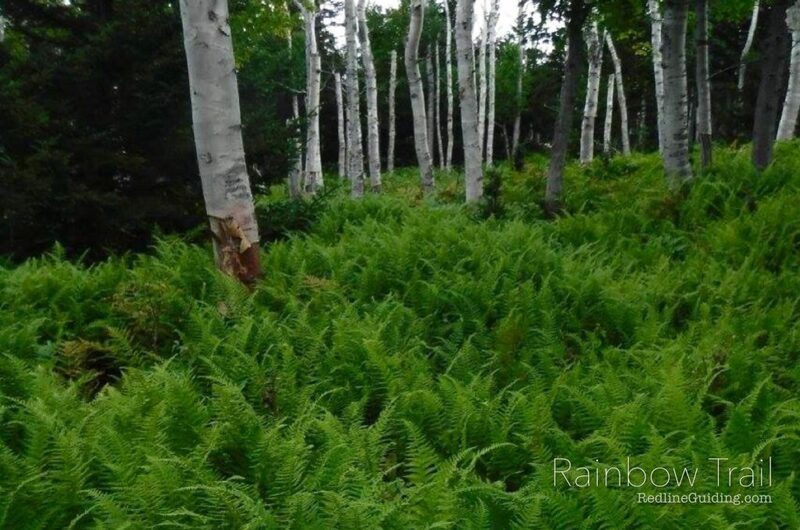 The incredible birch glades, here they are prettier than normal. Perfect. Only on the Rainbow Trail. I stopped to pick berries and admire the views in those amazing birch glades. We took lots of photos. There was no hurry other than to rescue the eight 16-ounce beers and fine sipping whisky Bill carried in to help us celebrate that were chilling in the river. He took a photo of me shutting it down, just as I did for him when he completed redlining on Webster Cliff Trail. Captured those final steps. It’s a bittersweet moment to be sure. Mostly sweet, though. We made our way to camp, which was packed with hikers much to everyone’s dismay (but we all eventually celebrated together), Ashley also joined us, we ate, and drank, then rested. We still had to hike out the next morning. Now on trails that I’d already hiked. It was an unforgettable experience. Of the many that were had. This essay barely scratches the surface. A whole chapter could exist around the exploration of the Presidential Range – Dry River Wilderness alone. Now that I’m done I want to help Barb complete her goals, maybe finish the New England Hundred Highest for myself (nine to go), but I’ll really be happy revisiting many of the places I’ve been to — in addition to checking out the 21 miles of new trails discussed in the just-out 30th Edition… just to stay current, you know. Helping Barb with her lists. The 48 is done, shown here on Bondcliff at sunset. Speaking of re-visiting trails, it’s noteworthy that Bill is working on redlining again… well, that’s one sure way to revisit them all, I suppose. Bill runs now more than he hikes so this won’t take too long. He is already over 50% complete on round two. Will Bill lure me into doing it again? No way, that’s nuts. Oddly, though, lately I find I have an urge to run more. The idea behind redlining is to improve obscure trails through more regular use while reducing impact to the common trails (over)used to, say, hike 4000-footers. But that’s for the thinkers and managers, for the rest of us, we hiker folk, exploration drives us… or beauty… or solitude… or obsession… well, we all have our reasons. “Trails” like this one (East Branch) need more attention. Give them some love… start redlining today.